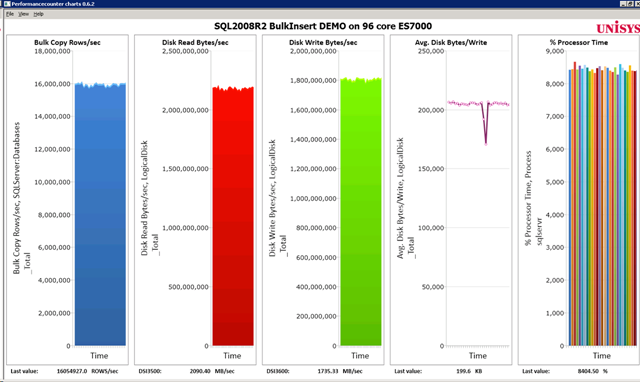 Hopefully you have seen the high-speed data loading demo live over the last 1.5 years at some SQL Server conference? 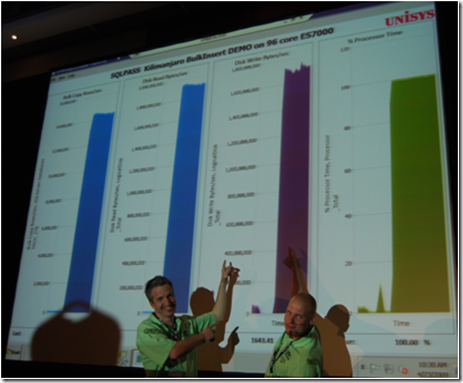 I remember demoing it the first time –live- with Thomas Kejser at the European SQLPass 2009 conference during the opening keynote to show the 64+ Core support in SQL2008 R2. 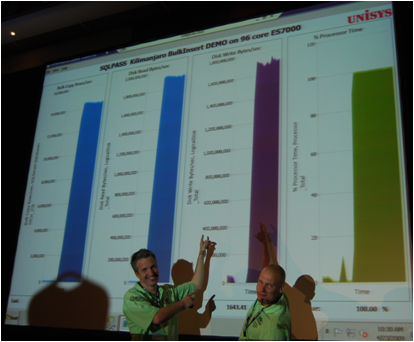 But for those of you who haven’t, hereby an impression of what data loading throughput you can achieve on a 96 core Unisys ES7000 Server with 2 DSI Solid State units attached (which we codenamed the SQL Powerrack); it’s running 3 times faster than our SQL 2008 ETL World Record of 1 TB within 30 minutes. A small movie tells you more than a thousand words, so watch how 96 flat files are being bulk inserted simultaneous into a single SQL database and read also how to get maximum speed out of bulk inserting yourselves. Reading the 96 flatfiles with a sustained read speed over 2000 MB/sec and inserting it into the database with over 1700 MB/sec… definitely some numbers to remember! 1) Configure multiple Windows LUN’s on the SSD devices. (With MPIO enabled at approx. 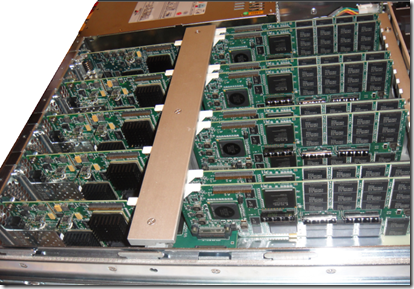 140000 IOPS a LUN gets saturated). 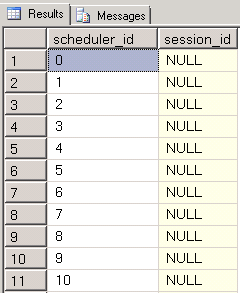 3) Use the “Harakiri” Stored Procedure to check that only 1 Bulk Insert task gets assigned to each SQL Scheduler. I was reading through my old notes from the SQL2008 ETL World Record and noticed that we ran with 56 parallel streams, each writing out the heavy-weight LineItem file data with approx. 10-12 MB/sec. Currently, with SQL2008R2, the write speed is up to 54-58 MB/sec per stream with 96 parallel streams. Quite a difference I would say! Also the disk write IO Response time decreased significantly, from 23-28 milliseconds to 11 milliseconds. When SQL is processing gigabytes of disk IO’s each second it’s worth it to take a snapshot of the sys.dm_os_wait_stats and sys.dm_os_latch_stats DMV to see where SQL is waiting for. A 1 minute snapshot while running at full speed shows that SQL’s no.1 wait is to read the data from the flat files. With 82% of the wait time. But, if you calculate the average wait time, you’ll see that it’s waiting for only 0.3 milliseconds for an file access IO while reading sustained 2GB/sec from SSD (and also writing over 1700MB/sec to SSD at the same time) is an amazing value also! A 1 minute snapshot of the the sys.dm_os_latch_stats show that waits for memory buffer page synchronization requests take on average 1.7 msec. statistics, like datetime stamps, duration, IO information, CPU time, CPU/scheduler ID etc., are written into the table also to verify afterwards. (The table definition is listed below). Next, basically the only tuning we do is to check if a SQL scheduler is already allocated to another Bulk Insert task, and if so, to pick another one. 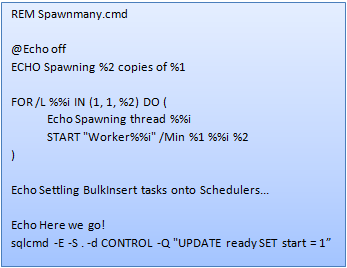 By default, a new session is assigned to any available scheduler in a round robin fashion way, so when for example 2 (or more) Bulk insert tasks reside on the same scheduler, they will stay on that scheduler and have to share the CPU ticks till their both done bulk inserting. 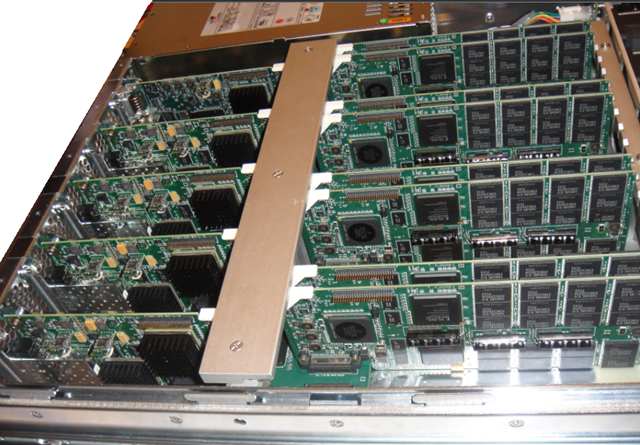 This might not be the most effective way to distribute the workload across a multi core server. So if you would prevent this from happening you can apply TCP port mapping and soft numa (like we did with the ETL WR) or … keep reading! For example to start 96 parallel Bulk Inserts, just type: “Spawnmany Bulk2 96”. The heart of the bulk loading routine we use is a Stored Procedure that picks a task from a work queue (sp_get_work), checks for a free scheduler and then waits for the “start=1” signal from the Spawnmany.cmd file to continue. Once it’s done with each of the bulk inserting tasks, the session duration and statistics are updated (sp_end_work) and it will check the queue if there’s more work to be done. 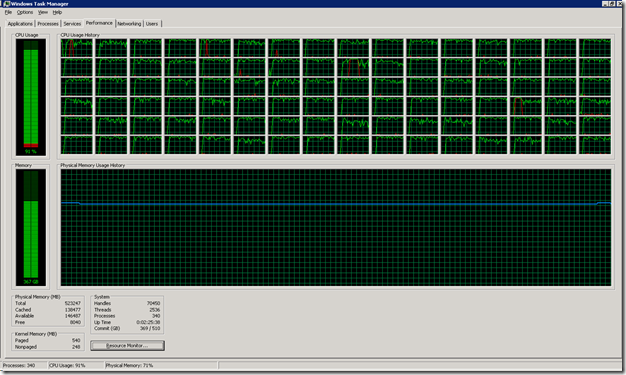 “SELECT cpu_count AS [Logical CPU Count] FROM sys.dm_os_sys_info; “ or check with “master..xp_msver ProcessorCount” . If you want to “hard” limit the maximum number of parallel bulk insert tasks the table should contains less. When the task is finished the “is_done” flag gets set and the session run details are written out to the queue. That’s all there is to it! 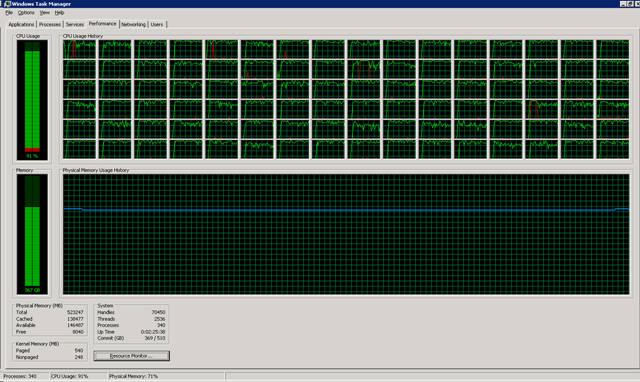 Or… maybe there’s something else to take into account when writing out data at high speed to SSD storage. What about the SSD “wearing effect” or housekeeping operations that are going on in the background to spread the write load evenly across all the chips ? Until a couple of weeks ago when I was investigating performance logs from a customer who was using these entry level PCI-E SSD cards, I never realized that the DSI Solid state units which I have been stress testing very hard for months (actually, since January 2009 already) do not show any noticeable form of write throughput degradation or even latency increase under high pressure, not even when hammering them for hours. and I wrote Petabytes of data to them by now. Reason: the backend write capacity outperforms the maximum load that the front-end ports can ever provide. Lucky me! (However when your budget is a bit tight and only allows you to buy some PCI-E SSD cards, make sure you check the Virtual File Stats (sys.dm_io_virtual_file_stats) to see how much data has been written to tempdb or any of the database files that you would like to store on SSD, and predict the write IO workload on an hourly or daily basis). I vote this page the Best blog of 2011, Congrats from me, you had the best articals 2 year2 in a row, keep up the good work. I know this article is old… but are there any details about the data being loaded? (how the load data was created, target tables, etc.) Or am I missing something? this generates files with random data. If this type of data loads fast, then real world data will be even faster!